In 2007 I created the artwork 'If These Walls Could Speak' on the side of the Public Library lift shafts, OBA Amsterdam. The artwork consists of a typographic figuration of titles I selected from the library's collection. The lift cabin with visitor journeys through darkness as it were, past an endless story composed of 'stolen' and 'borrowed' titles, such as 'The Art of Writing', 'The Murmuring of the Muse', 'Elevator Madness', 'Heaven and Hell' and 'The Birth of the Poet'. 'The Birth of the Poet' ('De Geboorte van de Dichter') is a stage piece by Richard Foreman, for which Kathy Acker wrote the libretto, with a set design by artist David Salle and music by Peter Gordon. 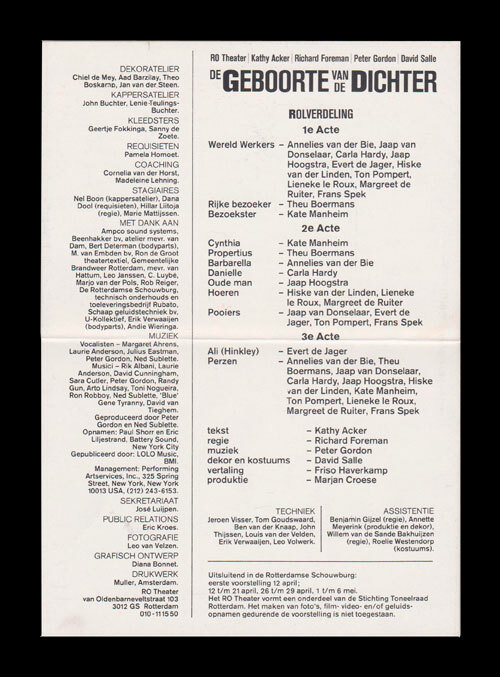 Staged in America in 1985, it had its premiere in the RO Theater in Rotterdam in 1984, where I was in the audience. Incorporating 'The Birth of the Poet' title in the 'If These Walls Could Speak' artwork many years later, is my covert little ode to this intriguing Gesamtkunstwerk, and at the same time a reminder of Kathy Acker's oeuvre. A biography of Kathy Acker (1944-1997) was published recently in 2017, written by Chris Kraus. Remarkably, not a single word is devoted to the preparations and performance of 'The Birth of The Poet' in the biography, 'After Kathy Acker'. The key piece is conspicuously absent, an omission in the biography. Meanwhile, the public is still waiting for a special reissue of 'The Birth of the Poet', with original recordings of the Zeitgeist document in vision and sound. Moreover, the time is ripe for a reprise, a re-enactment - 'The Rebirth of the Poet'.